This is one that I forget to try. I should do it today as I have some overnight oats waiting for me right now. Thanks for the love and support all these years! And thanks for the pick-me-ups when I’ve needed them. Love you too! I like peanut butter on fruit! My favorite way to eat peanut butter is on warm lightly toasted (gluten-free) bread with a touch of honey on top!! Mmm, honey! We have our own honey/bees and I never think to do this. Must try soon! My favorite way to eat peanut butter is to spread on a celery stick. Glad to see you back. good luck with the new endeavor. Thanks Marsha. My mom often made us celery and pb as kids. It is a great snack, thanks for the reminder. My favorite is on Udi’s multigrain toast with raspberry jam. Yum!!! I was probably one of the few kids who hated peanut butter, but discovered as an adult that I LOVE it! That is funny that you didn’t like it as a child. We love it here too. And I forget about jam as I don’t eat it very often. I love PB in a gf Engine 2 wrap with a banana. What a great breakfast! Agreed. I often have Udi’s toast with PB and a sliced banana. I love peanut butter eaten straight from the jar with a spoon! Straight from the source, no need to mess it up, right? I am so impressed by the courage you had to make such a big switch – you are awesome! Nice to see you back in action. And really, peanut butter with chocolate in any way, shape or form will make me happy any day! My favorite way to eat peanut butter is in buckeyes!!!! Thanks, bro! Buckeyes are the best! Wish I would have had time to make them before you guys came to visit. Then you could have helped me eat them as they are so dangerous to have in the frig. Oh wow! Congrats on your program, I know it can be a LOT of work. Best of luck with all of it. I was a huge PB fan until I realized it didn’t agree with me, but I LOVE all other nutbutters. And please don’t enter me into the giveaway. I love peanut butter and chocolate the best. But I regularly eat peanut butter on gluten free toast for breakfast most mornings because it gives me the protein I need to make it until lunch. I also love to eat KIND peanut butter whole grain clusters mixed in my Greek yogurt for an additional protein boost! Good for you for making a career change in your 30’s. It’s difficult but worth it. I work in occupational therapy in a skilled nursing facility and regularly educate my co-workers, patients and patient’s families on celiac disease and have come across multiple patients with celiac disease in this setting. I am also a peanut butter toast fan. Often with half a sliced banana on top. I am sure your patients appreciate your sympathetic ear when they find you have celiac too. My favorite way to eat peanut butter is right off the spoon with a glass of cold milk. 2nd favorite is skipping the spoon & using a gluten free chocolate pretzel as my utensil – YUM! Haha. Yes, skip the spoon! The chocolate covered pretzel sound delish. I can’t keep them in the house though cause they are gone in an instant! My favorite way to eat peanut butter is mixed into my protein shake!! Peanut butter sauces — from all over South East Asia and China too! and I love every Kind bar I’ve tried. Yes, I can put a peanut butter sauce on about anything and make it a meal! :-) I made a slaw last night with some leftover peanut butter sauce/dressing. Yum! Moonsword – You are the winner. I will email you for your address so that KIND can get your prize out to you. Thanks for participating! I, too, have changed my focus on food and eating since going gluten-free almost 8 years ago. It’s amazing to see the affects of food on the body. Good for you for making the big change to become a dietitian. 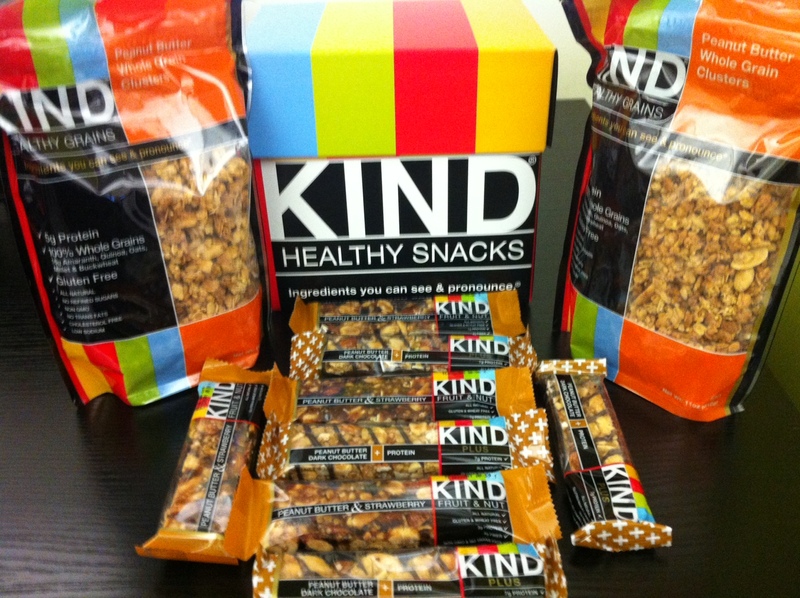 And, I have to say that I love Kind bars! The peanut butter and dark chocolate variety was the first of my favorites. But now, my favorite that I always have on hand is the dark chocolate and cherry variety. We also love the macadamia and apricot at our house. I haven’t tried the dark chocolate and cherry ones. I usually steer clear of the ones with chocolate for my purse but maybe I need to check that one out! The cherry and almond have been my favorite. Straight from the jar on a spoon! Yep, I’ve been known to do that too! You will make the best dietician EVER! I love the subject… So fascinating- I think especially when you have a food I tolerance! Right? Well like you, I neither can choose a favorite way to eat the great and powerful PB! I love to take a banana- slice it in half long ways and put PB in it, especially crunchy PB. I also sometime put enjoy life mini Choco chips in the PB in the banana. I also love to dip pop corn in PB! Nomnomnomnom PB! And thank you for turning me into KIND a couple years ago when you mentioned them at a 4th of July party, can’t go any where without them myself! Aw, thanks, Amanda! And popcorn in PB, hmmm, sounds interesting. Right out of the jar on a spoon…dipped in a bag of mini chocolate chips! Mouth watering…time to step away from the computer….